After entering this information, a web browser (firefox here) automatically pops up for http://localhost:8080/apex/listenerConfigure to complete the configuration, most importantly the connection settings to the database, in a graphical environment. 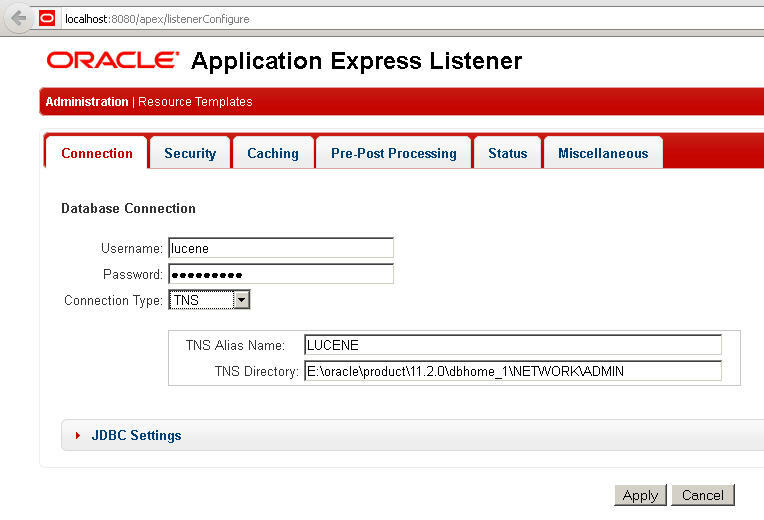 I configured the connection (to tns) and clicked apply. This will, suprisingly to me at first, load the apex login page … Forget about that, it has no other meaning than posting the request and logging you out of the initial configuration. 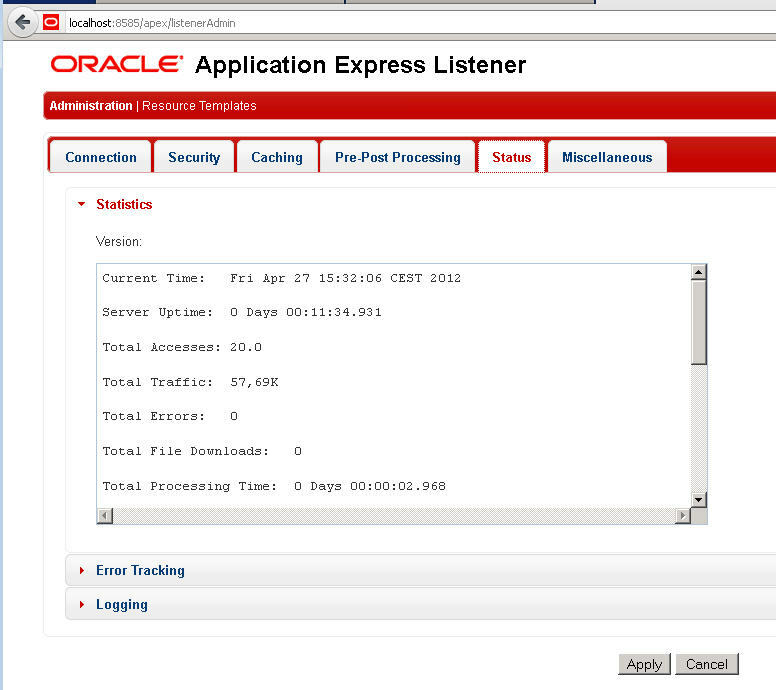 Try http://localhost:8080/apex/listenerConfigure one more time and the page will tell you that the apex listener has already been configured. 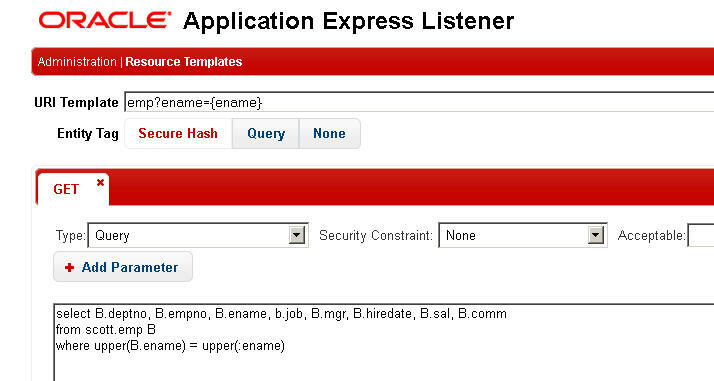 Any other configuration based on the given database connection will now employ http://localhost:8080/apex/listenerAdmin and after logging in as APEX Listener Administrator you’ll see the database connection tab data being greyed out because this data is fixed from now on. Also, the first usage statistics is available now for inspection. So far the apex listner is running. 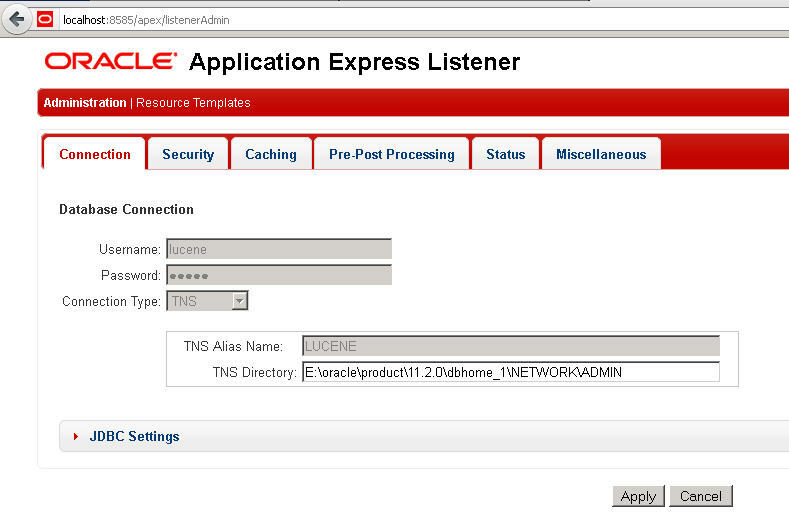 Do note that running the war file and playing around with the admin ui creates the apex listener configuration file E:\oracle\product\11.2.0\dbhome_1\apex-listener\runtime\apex-config.xml and the apex listener login data in E:\oracle\product\11.2.0\dbhome_1\apex-listener\credentials, see my advice concerning -Dapex.erase=true above. Actually waitung a jar full of seconds between shutting down and starting up does not show this issue. 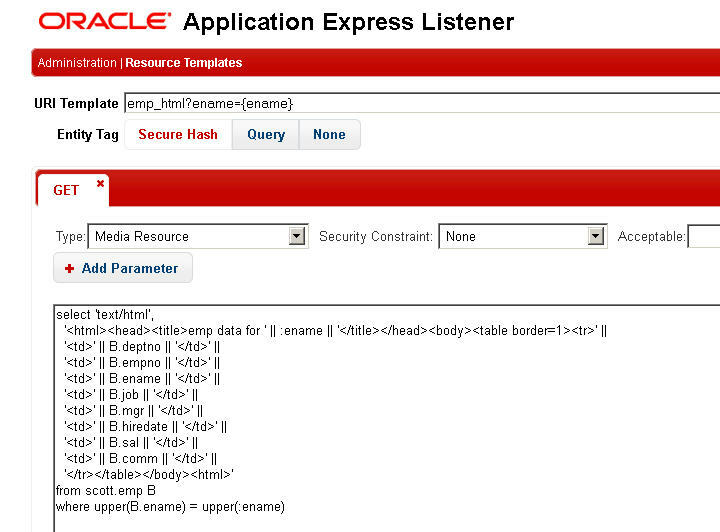 this is most probably a timing problem when loading the jdbc code into the apex listener runtime. Also, firstly asking for http://localhost:8080/apex and then changing to http://localhost:8080/apex/listenerAdmin worked well. 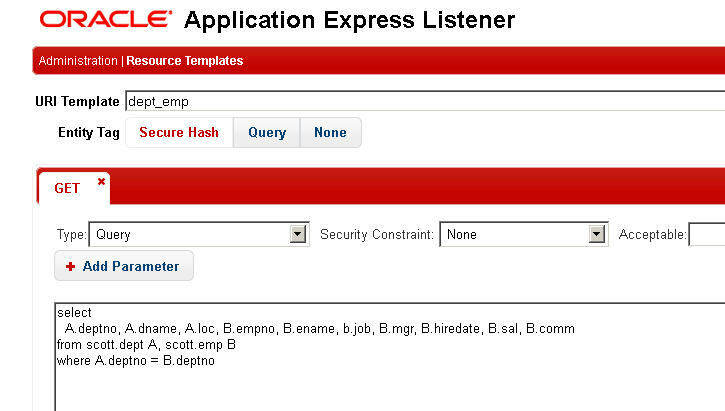 Keep in mind that the apex listener standalone is nothing to consider for productive environments. … as well as a parametrized select into scott.emp by column emp.ename using the auto allocation of uri parameter ename. 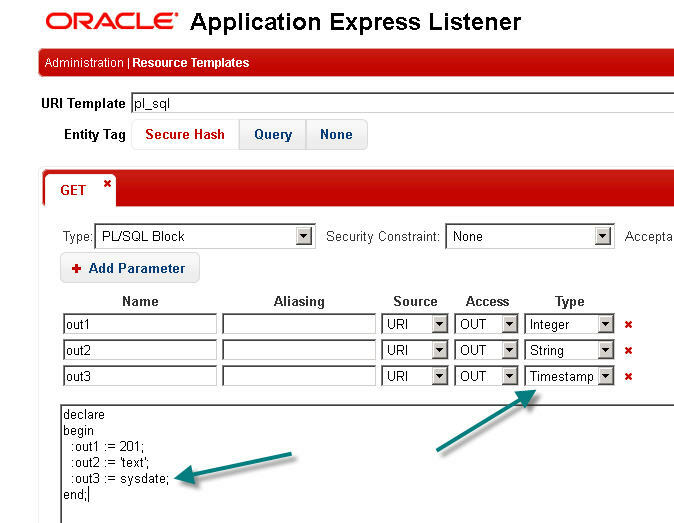 Further on i tried to execute some pl/sql anonymous block returning a json representation of the output parameters. This is where you have to manually specify parameters with the resource template because the get request can not derive the parameters from the incoming html. The last thing to check out so far was serving a media resource, html here, from an sql select using the predefined two-column structure on return. 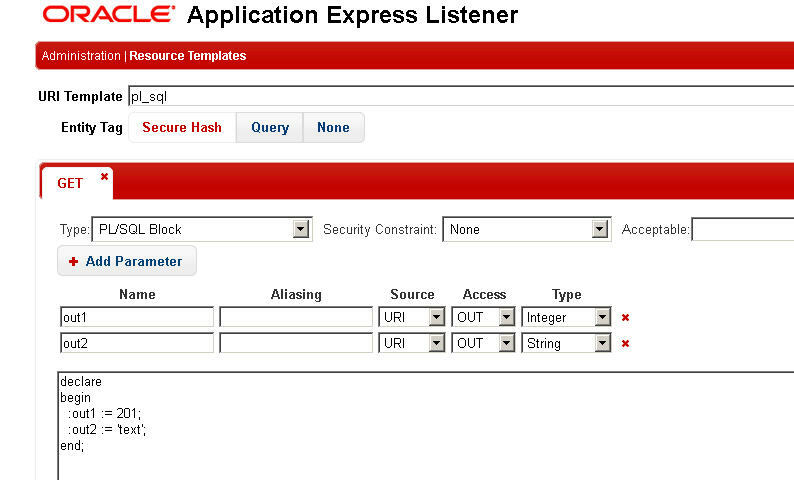 Because this is another standard use case of apex listener, no output parameters have to be given here as well. Quirk: Beware that the login window obviously asks for the credentials of the APEX Listener Manager but this will not work, APEX Listener Administrator credentials is nevessary here. The only page that APEX Listener Manager will be able to open is http://localhost:8080/apex/listenerAdmin, as far as I know up to now. Quirk: Trying to set an out parameter of type java.sql.Timestamp raised an exception on the console telling me that this mapping is not (yet?) supported. I expect to see this mapping in some never version.